The Aveda Institute is giving away 5 full scholarships to their hair schools in 5 different cities across Canada. To win, submit a video explaining why you were Born To Style. This is a judged contest. Pull out all the stops, the pizazz and the sizzle, because you have to convince a panel of celebrity judges from across Canada (from 5 cities: Victoria, Vancouver, Calagry, Winnipeg and Toronto) why you should win. … showing you were Born To Style, along with why you’ve got the talent, passion and determination it takes to develop your hairstyling skills with the Aveda Institute Canada. … visit the Aveda Institue Scholarship website to enter the contest. Upload your video (before March 31st 2012) then share your entry with the world! Get your family, friends, fans and followers to rate your video. … the panel of hair and beauty professionals, along with our faculty, will select 5 aspiring hairstylists in each city (see above) to advance to the final round. The selected future hairstylists will participate in a live “head-to-head” competition and runway show, putting together a complete look in front of a panel of style experts and hairstyling heavy hitters. The winner in each city will be awarded a full scholarship to the Aveda Institute hair school! The Aveda Institute is a top hair school that takes talented and creative individuals and turns out professional hair artists. These skilled artisans are highly creative and their best work graces the covers and editorial pages of the worlds best fashion magazines. 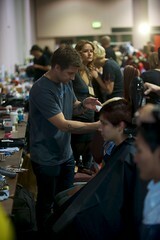 For more information on the institute and their program, check out the Aveda Institute Canada website. Have you every entered a contest with very specific criteria? We Are 1/2 Way There!